Architects employ a variety of tools to communicate their designs to clients, the public, and other professionals. A range of drawings--including plans, sections, elevations, renderings, and axonometrics--convey specific information about how a building will look and how people will move within its spaces. Taken together, these drawings create a complete picture of a final building. Methods for making these drawings have changed greatly over the last two centuries. 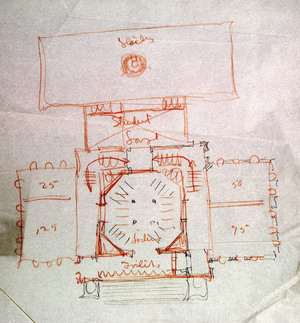 Although Jefferson’s pen and paper are quite different from the computers used by today’s architects, the drawings they produce express design ideas in similar ways. Architects often begin designing by making sketches. These can be created quickly, even while an architect is talking about the building. Such drawings usually show only the most basic elements. 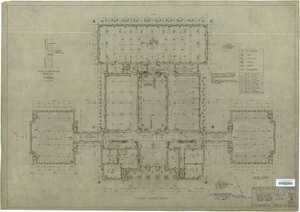 This early iteration of Clark Hall by Walter Dabney Blair is done on tracing paper, a disposable medium in use since the mid-1880s that can be traced over. 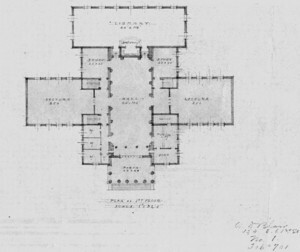 The sketch shows only the general footprint, the relationships between spaces, and the location of stairs. Notations mark the major spaces – including the library stacks, student lounge, lockers, and toilets – and the number of seats in the four lecture halls. This drawing is a plan: a two-dimensional graphic representation of a design, showing only the horizontal dimensions. As if an imaginary knife sliced the building through the middle from side to side, a plan communicates the location of walls and other elements that are on the ground plane. As the design process continues and the architects discuss their plans with their client, drawings become more refined. This plan for Clark Hall by Blair is closer to the finished building than the quick sketch. It is also executed to scale, communicating the actual sizes and proportions of spaces. The final plans for a building communicate materials, specific dimensions, and construction specifications. 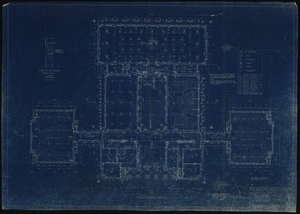 This plan of Clark Hall shows the auditorium wings, portico, library stacks, and Memorial Hall as built. Skilled draftsmen often executed final drawings with ink on linen, an art that has largely been lost. These beautiful illustrations could serve as both presentation drawings and images from which to generate construction documents like blueprints.